Sometimes it’s the quietest operators that pack the biggest punch. Regulars to Nobby Beach will have already admired the circular Chinese culture-inspired wrought iron gate and stain glass door entryway with intrigue. But for those who’ve been obliviously zooming past on the Gold Coast Highway or perhaps live on the other end of town, it’s unlikely you’ve caught whisper of Ally Chow. A passion project of two chef-hat calibre Trent Scarr and his partner Leisha Novy, Ally Chow is that grungy atmospheric eating place we hoped would rise from the ashes on this prominent Nobby Beach corner. 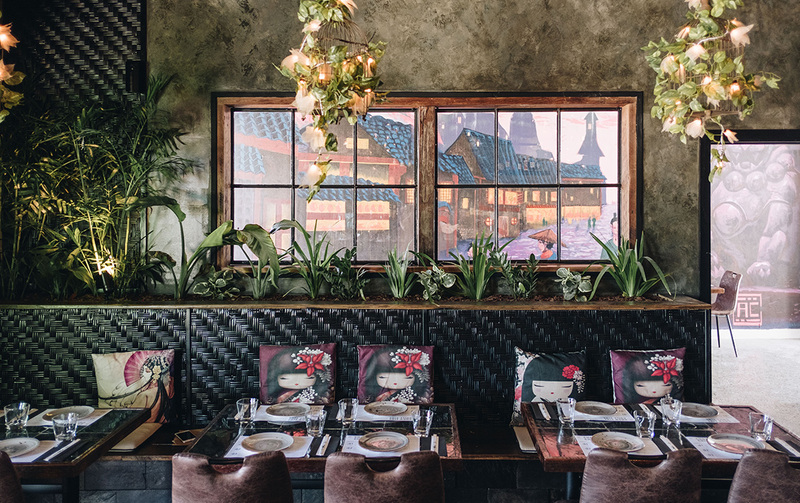 Previously of Honey Eater Kitchen, Trent and Leisha’s new venue Ally Chow is everything that light and bright Honey Eater wasn’t. This time around, they’ve truly let their personalities shine through in the moody, soul-filled décor and impressively crafted menu. And we reckon you’re going to love it. Since this corner complex was levelled by fire in July 2016, it’s felt like Nobbys was kinda missing that tangible spark. Our attention was turned to Palm Beach then back to Burleigh and Broadbeach, but it’s clear 2018 will be Nobbys’ turn to again step into the limelight. In a respectable nod to the recent firey chapter of the building’s life, Ally Chow has utilised an ancient Japanese wood preserving technique, where all panelling lining the exterior has been charred to create an inky black burnt look that instantly adds age and character. Inside, glossy black concrete floors and high raw concrete ceilings are softened with a hanging urban jungle of birdcages, recyclables and greenery. While the music is boisterously loud, the funky setting is casually inviting with thoughtful Asian inspirations throughout. Combined with street side and alleyway seating (yep, there’s a rad graffiti-splashed laneway alongside! ), there’s collective space for 70 or so and we can’t wait to see the space pumping. 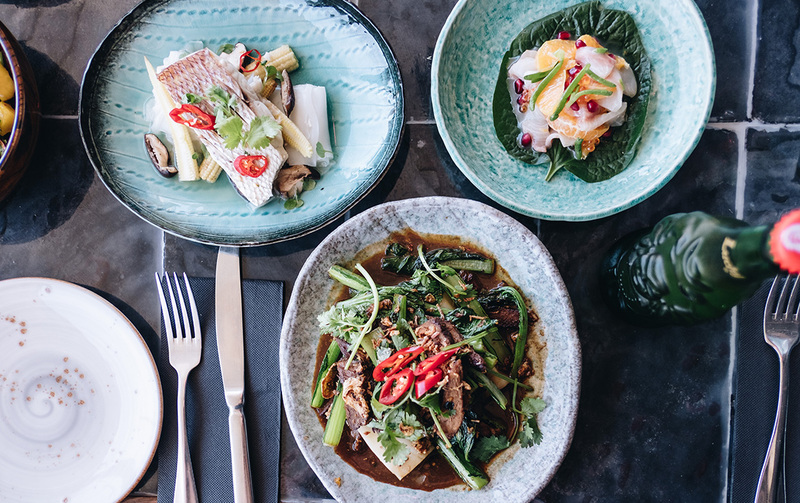 While Asian street food has been hot on the Coast for some time now, Ally Chow is taking the concept up several notches, with their core focus on fresh, clean, light, healthy and ultimately super tasty dishes. Infiltrated with their favourite elements from Vietnamese, Chinese, Japanese, Thai cuisine and more, not only are the flavours deep and punchy, the presentation is hella impressive for what they’re classifying street food. On our first visit, we opted to be guided by the main man, trying many of chef Trent’s faves. Starting with betel leaf piled with Kingfish, colourful pops of mandarin, pomegranate and salmon pearls, plus beach banana and drizzled with citrusy yuzushu. Next up, the generously portioned short rib spring rolls were served with a crack-like addictive gochujang dipping sauce. More please! With seafood sourced locally wherever possible, the Saddletail Snapper sitting atop a bed of rice noodle, baby corn, shitake mushroom and ginger broth is already high on our eat-again list. As is the nek-level wok-tossed inside skirt steak, sweet soya, coriander with unpronounceables like cheong fun and gai lang. Gai who? Trust us, just eat it and weep. Or a delicate salad to exceed expectations involved flavoursome flaked crab hidden under seasonal mandarin, mango, then decorated with watercress and a light spicy sour dressing. 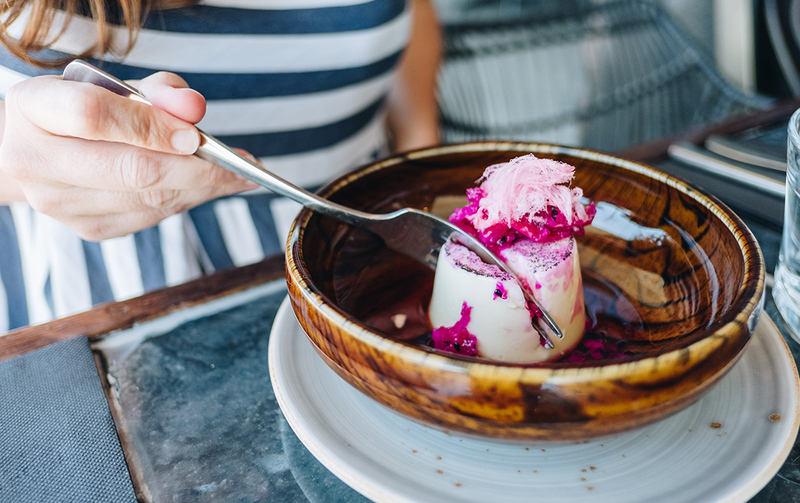 Trent’s signature vanilla bean panna cotta dessert, adorned with a dragonfruit and plum wine broth and a fluff of fairy floss will have you whipping your phone out to Insta brag #dessertporn. While the unique banana and pink marshmallow spring rolls covered in choco fudge sauce will quickly see you sucking the sticky remnants off your fingers. If you eat like us, you get FOMO with every dish to pass your table that you didn’t order. To combat the inevitable drooling, we suggest heading straight to the top of the menu, ordering from three different banquet selections that’ll give you a healthy spread of options and zero regret. Now, by listening to us, you’d probably thinking it’s all about the food. But that’s where you’d be wrong. Ally Chow have got those who are on a liquid diet covered too. Yep, their drinks list is packed with signature cocktails and out of restraint we only tried two—the refreshingly slurpable Dragon Colada with white rum, dragon fruit and coconut cream and, our early favourite, the Vietnamese Coffee Martini, a potent combo of cold-drip coffee shaken with Kai vodka and condensed milk (or coconut condensed milk, on request). Love Frose? This 2016 summer hit is not going anywhere. While the wine list is short, sweet and mostly international, all are available by the glass and neatly priced under $10. And just like the pan-Asian menu, the 15-bottle strong beer list has representatives from across the continent, including bottles of Hanoi, Bintang, Kirin to 650ml Sapporo cans and China’s Lucky beer, which we’d personally order purely for the cute green Buddha bottle. With competition so freakin’ fierce for your business these days, it’s imperative new restaurateurs deliver the whole package, with atmosphere and a vibing experience being the glue that keeps the diners returning and spreading the good word. And we think Ally Chow is well and truly on the way to hitting all these bases. Ally Chow is now open Tuesdays through Sundays (closed Mondays); from 11:30am for lunch through until late for dinner or cocktails hanging at the cool bar. Want to check out more Nobby Beach goodness? You'll find Pinky's now open right next door.